Delhi Based Spy Bluetooth Watch Shop offers Spy Bluetooth Earpiece Watch in Delhi at best prices. Call : 9810211230 and get all type of Bluetooth watch prices. Spy Bluetooth Watch in Delhi is the latest Jammer free technology absorbed with all advantages of secret communications. Spy Bluetooth watch removes the hindrance of short transmission distance. With this Spy Bluetooth Watch in Delhi you can hear clearly in this invisible earpiece and can whisper with your partner by the new inductive Bluetooth glasses. First, you press the functional key for 3 seconds, the Spy Bluetooth watch will get open and when the indicators is still and keep blue, the Bluetooth Watch has started working. 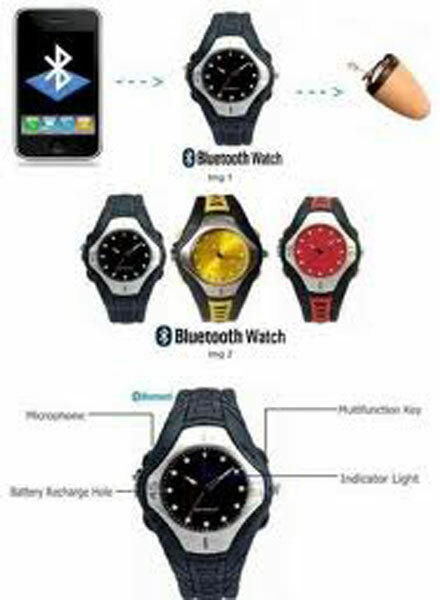 Open your Mobile Phone Bluetooth function and search for the Bluetooth watch in your phone, when the T9 on your phone. Select it, and enter the password “0000”, then Bluetooth watch indicator will shine for 2 times means that mobile has been paired with the Bluetooth watch. When someone calls your paired mobile phone, press the functional key of the Bluetooth watch and her you can hear the voice from the earpiece from a short distance. Connect the charger with the Bluetooth Watch, find the red indicator is on, charge the watch for 2-3 hours while first use. Make sure that do not charge Spy Bluetooth Watch for long time, which may shorten the battery life.